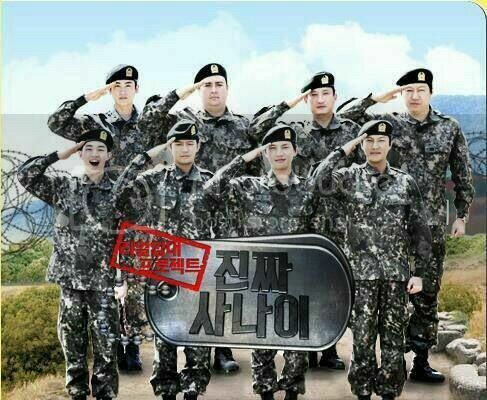 Real Men (진짜 사나이) is a South Korean variety show featuring eight male celebrities as they experience life in the army, which is mandatory for two years. The show debuted on MBC on April 14, 2013, as part of the Sunday Night programming block. During the season 1 the cast was composed by Kim Sooro, Mir (MBLAQ), Ryu Sooyoung, Sam Hammington, Seo Kyungsuk and Son Jinyoung. Jang Hyuk and Park Hyung-sik (ZE:A) joined the cast later. Mir left the show in June 2013. In the current season 2, the reality show added new faces: the actor Chun JungMyung, Park GunHyung, K.Will, and Henry Lau (Super Junior). Its current cast lineup features actors Kim Sooro, boy band ZE:A’s Park Hyungsik, Australian comedian Sam Hammington and comedian Seo Kyungsuk. The reality show, which began airing in April last year, follows the life of male celebrities as they join the army as new conscripts. "Real Men" is one of the most-watched show in its time slot, with a viewer rating of about 13 percent. "Henry had a wake-up call for his fantasy of becoming a rifle-toting macho man during his latest experience with 'Real Men'. He had always wanted to be a sniper, a sharpshooter, but as it turned out, he wasn't prepared for the difference between guns in films and guns in real life. "Ever since I was young, whenever I saw a gun during a movie I wanted to shoot one," he said. "So I was prepared for target practice. But suddenly, there were really loud noises from the left and the right. I got shocked and suddenly scared.Everything was scary," he said, recalling the moment afterwards".Check out the moment below. @napimve Thanks for creating the thread of Real Men. I've been searching and wondering why there isn't a thread for this show. I just started watching Real Men early this year and enjoy watching it very much!! And do u know what episode does chun jung myung appears? @nanstarrr , I posted some parts of the episode 49, all I could find with eng subs. And Chun Jung Myung starts appearing since episode 53, he had an arm injured. Check out the hilarious clip below!see also: "kfc" reveal the behind the scenes video for their cf with henry. Sending the whole squad into conniptions, a displeased. Henry went through an embarrassing moment on the latest episode of “Real Men“! During taekwondo practice, Henry accidentally let loose a loud fart during warm-up stretches. Sending the whole squad into conniptions, a displeased squad leader sentenced them to push-ups – during which Henry sent off a second round of poison gas into the room! “I tried so hard not to fart, but it just came out when I was stretching,” Henry said later. Check out the hilarious clip below! Sam hammington received a lot of love and support from members and fellow soldiers on mbc’s “real men” after hearing of his father’s passing. Sam hammington. Sam Hammington received a lot of love and support from members and fellow soldiers on MBC’s “Real Men” after hearing of his father’s passing. Sam Hammington shared that he “felt how important spending time with the ones you love is” The members gave Sam support and shared in tears. Especially Super Junior’s Henry, a member on “Real Men”, felt empathetic. Having also grown up in another country, whenever he left home, he would feel stress and think about how his parents won’t be there forever. Will"s father visited the army base, henry told him that he owed k. Henry revealed that he wouldn"t have made it through "real men" without the help of fellow cast. Henry revealed that he wouldn”t have made it through “Real Men” without the help of fellow cast member K.Will. When K.Will”s father visited the army base, Henry told him that he owed K.Will a debt of gratitude. “When I thought about quitting “Real Men”, K.Will held on to me. That”s why I”m still here,” he told his father. Seo Kyung Suk, who had been listening in to the conversation, added, “When K.Will tried to leave, I was the one holding on to him,” bringing laughter to the set. It's ironic, this show often topped sunday variety show rating in SK but unpopular to international fans. But I won't deny there is sense of belonging factor contribute to the popularity of this show in SK. Yeah, only Ann who willing to sub his part, even suju fandom don't give a damn to sub this show unlike exo fandom, lol. Strings subbing this show in chinese not english. Kshow stop subbing this show after 3 episodes, probably because little click = less money. Btw I found a fandom of real man on FB, currently they're subbing old episodes. Their work already reaching to episode 3. I didn't know that this show is not liked by overseas fans. No wonder it doesn't have his own thread in this forum until recently. I am an overseas fan and love it very much. It's totally different than the other K variety shows and it gives me a chance to get to witness the harsh military life. It gets very touching to see how the celebrity members keeps fighting and try their best in the show, esp for the 'elderly' members. Although it's funny to watch Henry but his 'silly' actions and words sometimes worried me so much. My fav is K Will though although he doesn't get much air time in some episodes! K Will fighting!! Ann wont sub real man anymore will anyone share the eng sub please? @bangbangtang what's the name of the fandom?? rndl176 said: @bangbangtang what's the name of the fandom? ?